Photographer Ron Amir spent years visiting African migrants in the Israeli desert to understand the new world they had created. He came back with a provocative set of pictures -- without people in them. The human-less photographs include objects such as a makeshift bench and gym or a mud oven, composed in a way that hints at the migrants' desperation and their attempts to manufacture new lives. The exhibition, previously on display in Israel, is set to move to the Museum of Modern Art of the City of Paris, where it will open on September 14 and run until December 2. 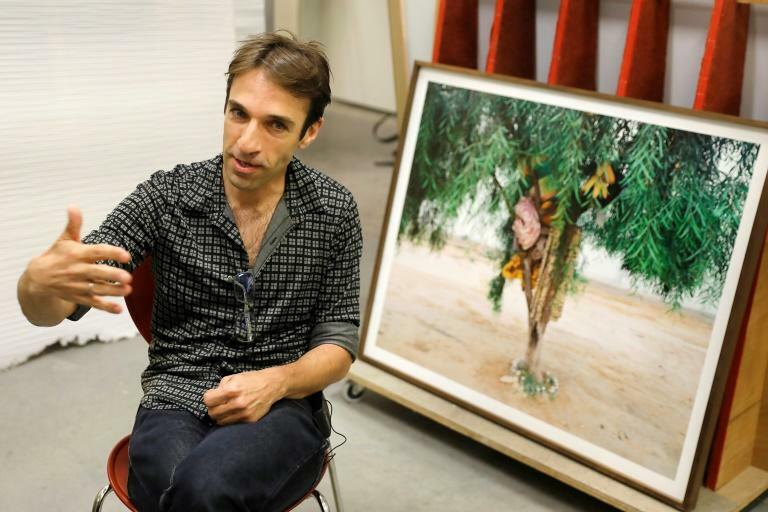 Amir said recently at the Israel Museum, where the exhibition appeared in 2016, that keeping people out of the pictures was a way to stimulate questions about what the viewer sees. It was a means to "open another channel of observation that enables developing broader connotations on these sites," the Israeli photographer said. In one, a plank of thin metal sits atop three stones, wild shrubs behind it leading to a cloudless sky and a red ball attached to power lines. 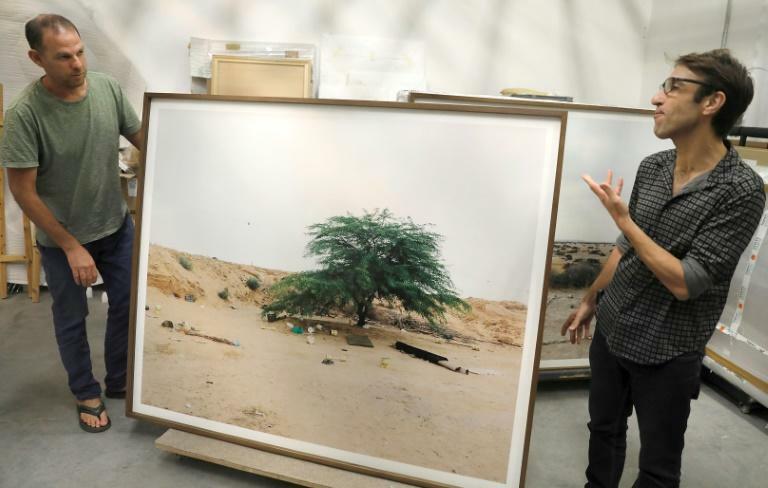 The understated photograph, its yellowish desert shades punctuated by red flecks of garbage, is named "Hamed Alnnil's Bench." Alnnil, one of the thousands of African migrants who were held at the Holot detention centre near Israel's border with Egypt, had ventured out of the open facility's boundaries to create his much-needed personal space. Amir had visited Holot over the years 2014-2016 and befriended some of the facility's residents, who showed him the spaces they had created -- most of them hidden away in the desert land surrounding Holot. Those held at the now-shuttered facility were allowed to leave during the day. Amir created a series of photographs of the special spaces, with some of them serving clear functions, such as the gym, an oven for baking bread or a row of stones delineating the outline of a small mosque. Others, such as a line of empty water bottles half-buried in the hard desert ground, give no hint as to their purpose. The 30 photographs show "what happens when people have a lot of time to kill," Amir said. The oven ultimately "tells more about us, about Israel, about the system, about the limitations it imposes -- and less about the people who came from Africa," he said. His decision to keep the migrants unseen in some ways matched what they were facing. At the time of Amir's work, the Israeli government was seeking a way to make the approximately 42,000 African migrants in the country vanish, with religious and conservative politicians portraying the presence of Muslim and Christian Africans as a threat to Israel's Jewish character. Many of the migrants, predominantly from Eritrea and Sudan, arrived in Israel illegally through Egypt's Sinai Peninsula. They settled in a number of poor neighbourhoods in the coastal city of Tel Aviv, the country's economic capital. Others were eventually sent to Holot. In April, Israeli Prime Minister Benjamin Netanyahu cancelled an agreement with the UN refugee agency aimed at avoiding forced deportations of thousands of the migrants. Under the deal, some 16,000 migrants were to be transferred to Western countries, with Israel giving residency to an equal number of them. Netanyahu faced heavy pressure to cancel the deal from his right-wing base, who want to see all the migrants expelled. Their fate now remains in limbo. Accompanying Amir's photographs are six videos from outside Holot which do contain people -- migrants chatting, posing for a picture, making coffee or listening to music and waiting. "In Ron's videos, nothing happens," said Noam Gal, the curator for Amir's exhibition in Jerusalem and Paris. "That's just the point -- you can see what's happening at Holot only if you take upon yourself to sit and kill time from your day, and understand that what happens to the people there is the same time as yours," he said. The exhibition arrives in Paris as France and other European states also seek ways to deal with an influx of migrants. 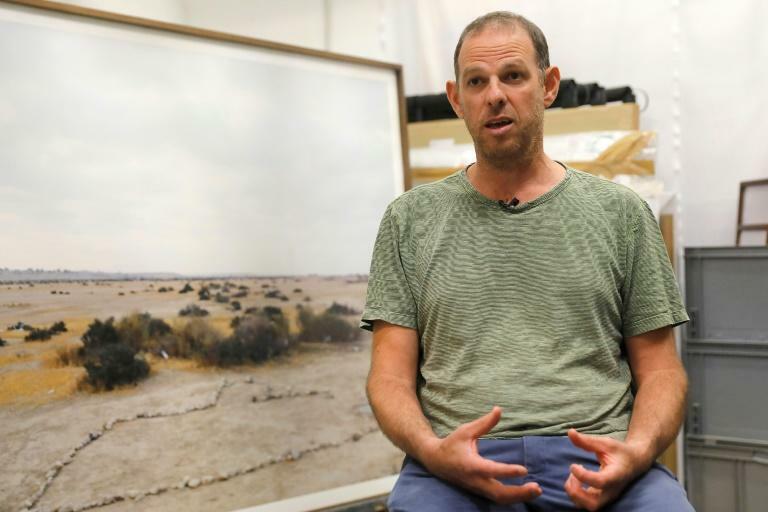 To Gal, the Israel Museum's curator of photography, the exhibition is also "an opportunity to draw public attention to the phenomenon (of asylum seekers) from the artistic perspective," he said. Doing so could even "expand the limits of the discourse so that it's not just between decision-makers of the high political and diplomatic echelons, but maybe there's room here for other voices," Gal said.